The Nightmare Warehouse is a new twist on an old Halloween tradition! After you enter Nightmare Warehouse in Enid there is no turning back. Known as the city's ultimate haunted house, you'll make your way through over 7,000 square feet of terror and fight the urge to run away as fast as you can. When the cellblock door slams shut, will you be ready to walk death row? This detailed Halloween attraction is located in what was once the Goldspot Dairy warehouse. It is now filled with live actors in grueling costumes, frightening animatronics and plenty of scary fun. 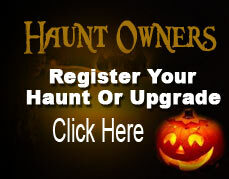 Oklahoma Haunted House Reviews ranks it as one of Oklahoma's top ten haunts. Times and sates subject to change.